Prescribe a book. Change a life! birth through 5 years is invited to join. 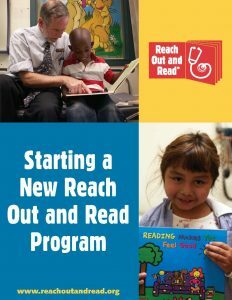 Learn about starting a Reach Out and Read program at your clinic. 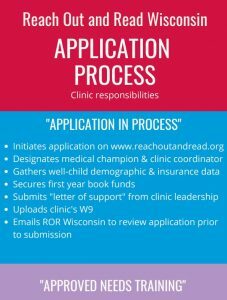 Use this checklist to guide you through the Reach Out and Read Wisconsin application process. Start your application at Reach Out and Read National Center. 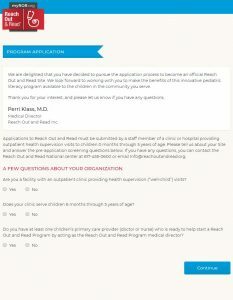 Why Start a Reach Out and Read Program? The American Academy of Pediatrics’ 2014 policy statement on Literacy Promotion describes the promotion of early literacy development as an essential component of primary care pediatric practice. Bright Futures Guidelines for Health Supervision of Infants, Children, and Adolescents recommends anticipatory guidance on reading aloud from birth to 5 years and endorses Reach Out and Read. Providers use books as developmental assessment tools to make the well-child visit more efficient, organic and fun. By supporting parents as their child’s first teacher, you can leverage your trusted relationship to strengthen families and communities. Providers promote parental skills and capacities around shared reading activities, enhancing relationships that can alleviate adverse childhood experiences. The number one indicator for adult health is literacy. Make Reach Out and Read a standard of care and help your pediatric patients become healthy adults. Learn more about early brain and literacy development on our blog, Books Build Better Brains.